We are still deep in snow. Everywhere you look is snow, snow, snow. Under there, somewhere under there, under that blanket of snow, the snowdrops are blooming, they are, I swear. But it will be weeks before I get to see their delicate petals and green throats. All this snow reminds me of the workshop at the Wise Woman Center some time ago, a workshop with White Feather, it was. 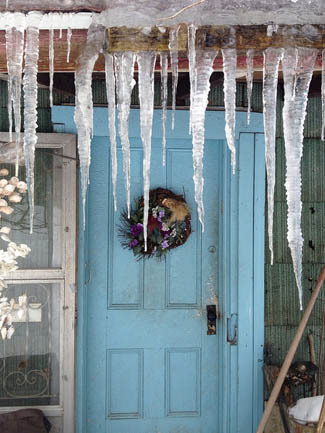 It snowed three feet and blew six foot drifts. Seriously. We had to shovel ourselves into the classroom and then shovel ourselves out again. All our cars were totally buried. Nature is powerful and stunning! The heart health teleseminar Robin Rose Bennett and I did last month caused quite a stir of interest. I am so glad. So glad the message is being received: Herbs and whole foods make a heart healthy, not drugs. Want to know more? How? Specifics? So do I, that's why I created a new course for you at the Wise Woman University: A Healthy Heart, the Wise Woman Way. 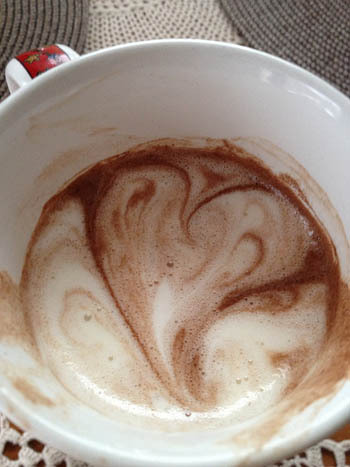 As Robin Rose said on our encore teleseminar, "the heart is the spirit of the person." A healthy heart is the keystone to good health, for an unhealthy heart contributes to dementia, kidney disease, diabetes, even loss of eyesight. I've been following the literature, and am happy to report that more and more studies are confirming that cardiovascular health is strongly influenced by diet. The recently concluded European Prospective Investigation into Cancer and Nutrition Heart Study – which followed more then 3000,000 people between the ages of 40-85 for more than eight years – found that diets high in cooked vegetables, whole grains, olive oil, fish, wine, and fruit and low in salt, preserved meats, and processed foods, help keep the heart and blood vessels healthy. Women who ate the most leafy greens – and nourishing herbal infusions count as leafy greens – were the least likely to die of coronary disease. I am excited to know that it is so easy to have a healthy heart as I age, with no need for drugs. I invite you to share the journey with me in the coming weeks. Meanwhile, here's a sneak preview from lesson one. 1. Avocados look like the heart and are ever so good for it. 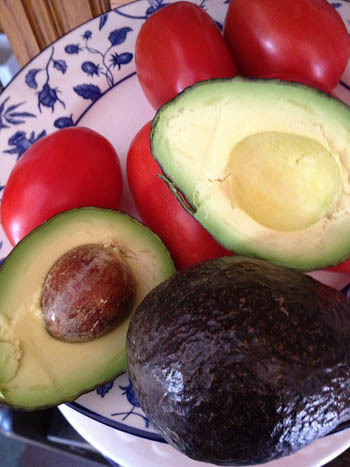 Avocados also provide lots of heart-healthy monounsaturated fats as well as blood-pressure lowering potassium. Avocados are also an excellent source of phytosterols, compounds that compete with cholesterol, and usually win, thus lowering total circulating cholesterol. Since avocados are expensive, I usually eat no more than 1-2 a week. 2. 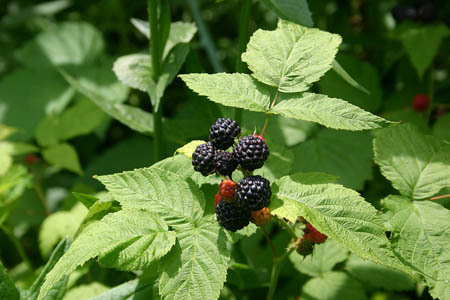 Berries, including blueberries, strawberries, blackberries, raspberries, and cranberries, make the heart leap for joy. Their polyphenols neutralize oxidized LDL, preventing it from forming plaque in the arteries. I eat 6-12 ounces of frozen berries a week. University of Scranton Pennsylvania researchers confirm that drinking cranberry juice daily can raise HDL cholesterol, decrease atherosclerosis, prevent plaque formation, and reduce overall heart disease by 40 percent. 3. Dark Chocolate does it all. Chocolate is loaded with heart healthy phytochemicals that keep blood pressure low, curb oxidation of LDL, prevent the build-up of plaque, protect the heart and blood vessels from damage, and, like a baby aspirin, keep the blood thin and freely flowing. There's a reason chocolates come in a heart shaped box. I eat 1-4 ounces of the darkest chocolate I can find at least three times a week. 4. Fatty fish such as salmon, trout, herring, sardines, mackerel, barramundi, and anchovies are the leading source of omega-3 fatty acids. These essential fats lower heart rate, lower blood pressure, keep the blood vessels flexible, and prevent (or treat) arrhythmias (irregular heartbeats). 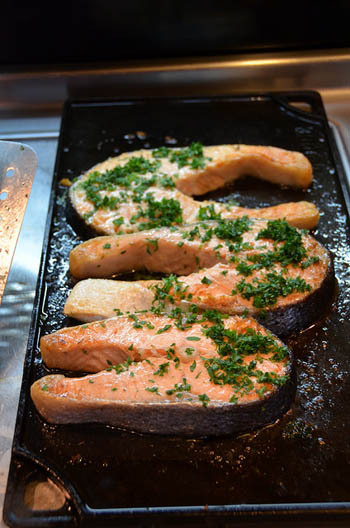 Numerous studies confirm that the more fish in the diet, the lower the risk of dying from heart disease. I eat fatty fish at least twice a week, often more. Canned fish are just as good, or better, than fresh fish in terms of heart health and nutritional value. 5. 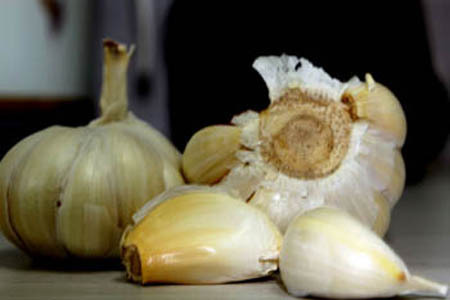 Garlic offers heart health, resistance to cancer, and better circulation in one little clove. Regular use lowers blood pressure, reduces cholesterol, strengthens the heart, reduces platelet clumping, and stabilizes blood sugar. I make it a point to include garlic and garlic powder in my daily diet. 6. Leafy greens such as kale, collards, spinach, beet greens, amaranth greens, lamb's quarter, and chard – when well cooked, but not when raw – provide alpha-linolenic acid, which acts like the omega-3 fatty acids found in fish. They are also incredibly dense in vitamins and minerals needed for heart and blood vessel health. 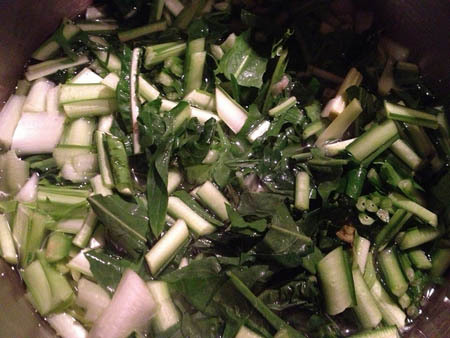 Fiber, and cooked greens are a great source of fiber, helps counter cholesterol. I eat 5-7 servings of cooked leafy greens a week. 7. Honey is soothing to the heart. 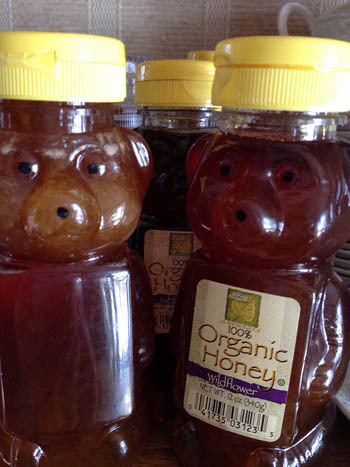 Studies have found that regular consumption of honey decreases cholesterol, lowers HDL, reduces homocysteine, and even brings down C-reactive protein. I eat 1-3 teaspoons of honey a day. 8. 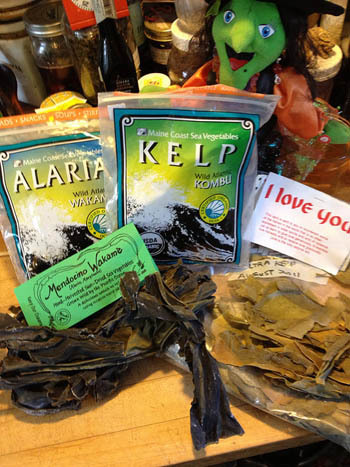 Kelp – sold as wakame, kombu, or bullwhip kelp – takes some getting used to, but repays the effort in longevity and freedom from heart woes. I eat at least one dish (beans, rice, oatmeal, soup) containing cooked kelp weekly. 9. 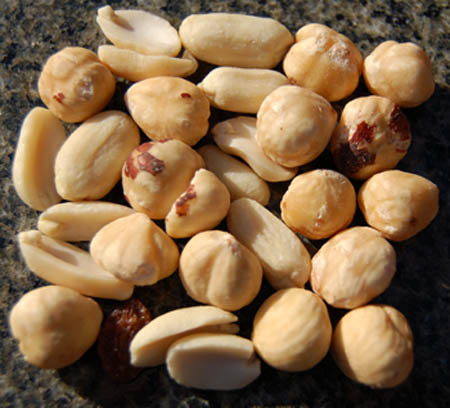 Nuts, including peanuts, provide lots of cholesterol-countering fiber and plenty of heart-healthy vitamins and minerals. Special phytochemicals found in nuts lower blood pressure, total cholesterol and LDL cholesterol, while raising HDL cholesterol. Recent studies at Yale have found as little as two ounces of walnuts a day can significantly improve blood vessel health. 10. 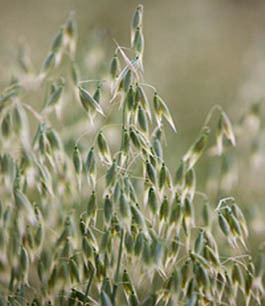 Oats are a prime example of the heart health contained in whole grains. Insoluble fibers in whole grains – including whole wheat, brown rice, quinoa, amaranth, kasha, millet, corn, and oats – prevent the body from absorbing cholesterol. They also even out blood sugar and help prevent adult-onset diabetes, a risk factor for heart disease. 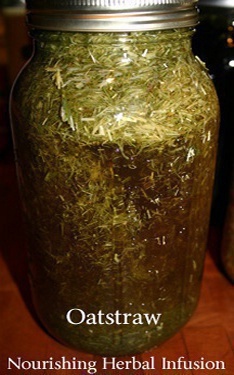 I drink 1-2 quarts of oatstraw infusion a week and eat rolled or steel cut oats 2-3 times a month. 11. 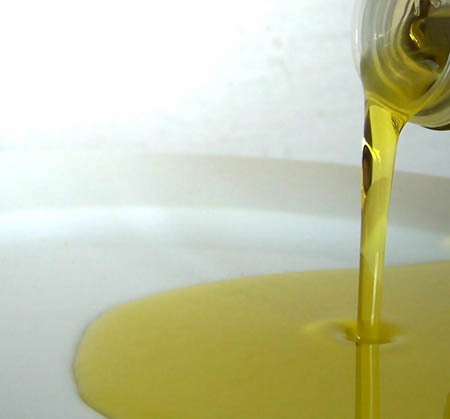 Olive oil lowers inflammation and counters cholesterol. It lowers LDL, keeps blood circulating freely (thins the blood, so to speak), counters stickiness of the cells, and moderates blood sugar swings too. Only extra virgin olive oil contains heart-healthy polyphenols. I consume 1-4 tablespoonfuls of extra virgin olive oil daily. 12. 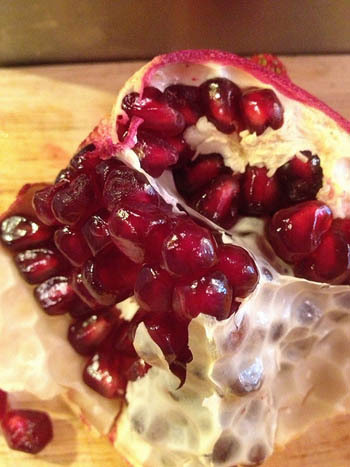 Pomegranate juice gives us the benefit of the entire fruit: rind, seeds, and fleshy, juicy arils. The medicinal properties, including polyphenols, are most concentrated in the hard parts, so commercial juice is more effective for heart health than eating raw pomegranate. I drink ½-1 cups of pomegranate juice a week. 13. Shiitake are the mushroom that we take to heart. Exposed to direct sunlight, they produce vitamin D even after being dried. Shiitake are a proven ally to anyone desiring a healthy heart. 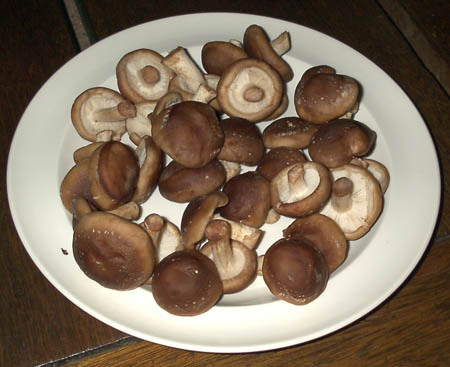 I eat shiitake cooked in soup or add shiitake vinegar to my cooked greens at least once a week.